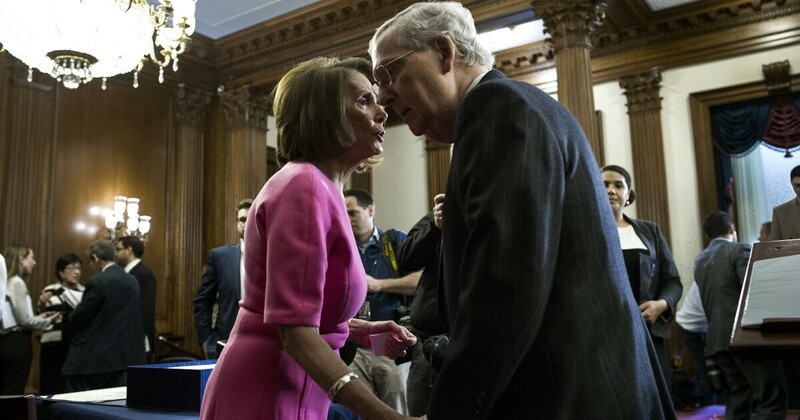 House Speaker Nancy Pelosi and Majority Leader Mitch McConnell said this week they are both ready to sit down together to try to work out a long-elusive deal on immigration reform in response to a growing humanitarian crisis along the southern border. Pelosi, D-Calif., speaking to reporters at the Democratic retreat in Leesburg, Va., said she is “pleased to see” news reports that McConnell, R-Ky., “is ready to talk about” about an immigration deal. While lawmakers normally avoid taking up major policy initiatives when a presidential election is looming, they may have no choice. A sudden surge in family units attempting to cross into the United States illegally has overwhelmed the nation’s border security system. So far this year, 240,000 illegal immigrants have been apprehended entering the United States, some at ports of entry, but mostly at points in between along the southwest border. The increase accelerated after July 2015, when a federal judge ruled that illegal immigrant parents must be released with children soon after they are apprehended. The court ruling attracted mass family migration from Central America as adults learned bringing children to the U.S. border would prevent them from being detained or immediately sent home. The GOP wants to change the nation’s asylum laws and rules governing the treatment of apprehended illegal immigrants in order to discourage the recent wave of mass migration from Central America. Finding a bipartisan deal with Democrats, however, would likely require a comprehensive plan that addresses illegal immigrants already living in the United States. Democrats and Republicans have tried but failed to pass immigration reform legislation numerous times over the past 15 years. Democrats want a pathway to citizenship for illegal immigrants already in the country, while Republicans have sought stronger border security provisions. Pelosi said none of the current problems along the border can be fixed without tackling comprehensive immigration reform. “I think the president is beginning to realize that has to happen,” Pelosi said. Shouldn’t Nancy Pelosi want detainees released into her sanctuary city? 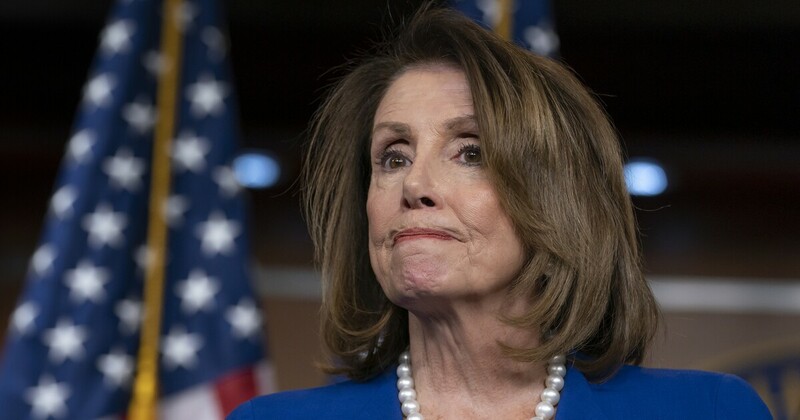 House Speaker Nancy Pelosi, D-Calif., would consider it punishment were her city saddled with more undocumented migrants while they await their court hearings. The whole point of sanctuary cities, from the standpoint of their lawmakers, is that illegal immigrants need a safe place to evade deportation. Illegal entrants and asylum seekers, after all, are only here to pursue a better life for themselves and their families (and all the better if Democrats can load them up on welfare). Why, then, would a city like San Francisco, which lies in Pelosi’s district, not leap at the chance to bring in more of their well-meaning friends? Outside of providing more beds, free healthcare, and free child services, courtesy of the American taxpayer, Democrats in Congress have shown no interest in doing anything about the hundreds of thousands of migrants making their way to the U.S. from Central America. Wouldn’t these well-meaning foreigners be best served in cities like New York, Boston, and Seattle, where local authorities refuse to comply with federal agents in deporting illegal aliens? The Post’s story never really demonstrates that the intent of the White House was to “retaliate against President Trump’s political adversaries,” as the article puts it. It cites unnamed sources who claim that was the purpose but, even though the story’s authors, Rachel Bade and Nick Miroff, said they reviewed “email messages,” the one email by a White House official in the report is completely innocuous. That’s it. That’s the one supposedly damning email sent by someone from the White House included in the Post’s story. Acting Deputy Director of ICE Matthew Albence replied to the email, suggesting that transporting aliens long distances from the border would be yet another strain on the agency and that there were liability concerns if anyone were hurt during the trip. In a statement to the Post, Albence denied that he was ever “pressured by anyone at the White House on the issue” and that he was merely “asked my opinion” and that his advice was heeded. A statement from the White House said effectively the same thing. Yet, even if the proposal was crafted as a politically cynical move, it doesn’t explain why Democrats wouldn’t eagerly invite more illegals or undocumented asylum seekers into the districts and cities that are supposed to be the most welcoming. Pelosi had said herself Thursday, “Of course there’s room and there’s a need” for more immigrants showing up at the border. Okay, but not in San Francisco! NEW DELHI (Reuters) – The head of Indian Prime Minister Narendra Modi’s ruling Hindu nationalist party took his invective against illegal Muslim immigrants to a new level this week as the general election kicked off, promising to throw them into the Bay of Bengal. Bharatiya Janata Party (BJP) President Amit Shah referred such illegal immigrants as “termites”, a description he also used last September, when he drew condemnation from rights groups. The U.S. State Department also noted the remark in its annual human rights report. 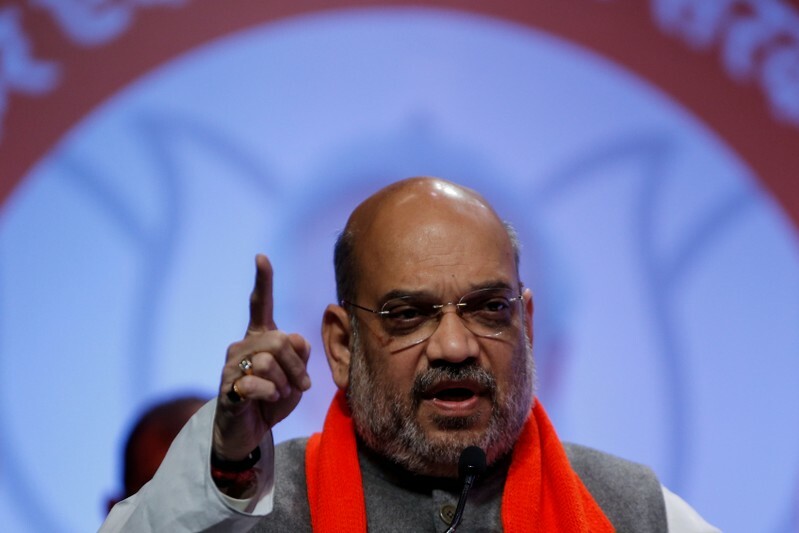 “Infiltrators are like termites in the soil of Bengal,” Shah said on Thursday at a rally in the eastern state of West Bengal, as voting in India’s 39-day general election started. “A Bharatiya Janata Party government will pick up infiltrators one by one and throw them into the Bay of Bengal,” he said, referring to illegal immigrants from neighboring Muslim-majority Bangladesh. Shah nevertheless reiterated the BJP’s stance on giving citizenship to Hindus, Buddhists, Jains and Sikhs from Bangladesh and Pakistan. India is already working on deporting an estimated 40,000 Rohingya Muslims living in the country after fleeing Buddhist-majority Myanmar. New Delhi considers them a security threat. The comments from Shah, the right-hand man of Modi, drew criticism from the main opposition Congress party as well as minority groups. On Twitter, some users likened his speech to a suggestion of ethnic cleansing. “The statement is a direct attack on the identity and integrity of the nation as a secular state,” the Kerala Christian Forum, a group from the southern state, said in a statement. It demanded an apology from Shah. A BJP spokesman declined to comment on the speech. Congress spokesman Sanjay Jha said Shah’s remarks were a deliberate attempt to polarize voters along sectarian lines. “The political business model of the BJP is to raise the communal temperature, keep it at a boil, and to keep India in a permanent religious divide,” Jha said. Outrage by liberals and Democrats over Attorney General William Barr noting that “spying did occur” on the 2016 Trump campaign is a sorry example of moving the goal posts. Last year, the active debate was not over whether spying occurred — which it did by a reasonable use of the word — but whether it was justified. Barr was careful not to weigh in on that debate. Yet Democrats, spurred on by their liberal base and supported by the media, have been out to portray Barr’s statement as some sort of shocking betrayal of his role as the nation’s top law enforcement officer. At the time, Republicans had been arguing that the FBI launched the investigation into Russian interference on the basis of a dossier that was based on research funded by the DNC and Clinton campaign. Democrats were arguing that “Christopher Steele’s raw intelligence reporting did not inform the FBI’s decision to initiate its counterintelligence investigation in late July 2016.” Instead, they argued that it began with information the FBI received that Russians were wooing a different Trump campaign foreign policy adviser, George Papadopoulos. Outside Congress, the debate also focused on whether there was “probable cause” for the FISA warrant, which those pushing back against Trump and Republicans argued that there was. So, the issue they were taking with conservative McCarthy was that he was attacking “the process” that was used “to spy on a former Trump advisor” — rather than arguing about whether the spying occurred. Indeed, the article itself is a case that the FISA warrant was totally justified. This is all perfectly consistent with what Barr said. The only part he’s stating unequivocally is that there was spying. He is not making a claim that the FISA warrant was illegally obtained on the basis of a Clinton-funded discredited dossier. He just said it was worthy of looking into to make sure the process was proper. But, even if people want to litigate this issue, it should be seen as a reasonable use of the word. My colleague Byron York noted several examples of the New York Times describing wiretapping as spying. This isn’t to say it’s hypocritical, as in this case, the discussion was about allowing warrantless access, whereas in the previous case, the argument was that there was probable cause for a warrant. But again, a debate over whether a warrant is justified on the basis of probable cause is different than whether the underlying government activity can be described as spying. It’s reasonable to argue that yes it can. Bill Priestap, left, with Michael Horowitz, DoJ inspector general. The spying, which Barr vowed to investigate, is not the only significant possible violation of investigative rules and ethics committed by agents, lawyers, managers, and officials at the FBI and the Department of Justice. A catalogue of those abuses can be found in recently released testimony that Edward William Priestap provided to Congress in a closed-door interview last summer. From the end of 2015 to the end of 2018 Bill Priestap was assistant director of the FBI’s Counterintelligence Division, which meant he oversaw the FBI’s global counterintelligence efforts. In that role, he managed both of the bureau’s most politically sensitive investigations: the inquiry into Hillary Clinton’s handling of classified information and the probe into whether Donald Trump or his campaign conspired with Russia to steal the 2016 presidential election. His testimony provides rare insight into the attitudes and thoughts of officials who launched the Russia probe and the probe of Special Counsel Robert Mueller, whose final report is expected to be released very soon. Priestap’s testimony took place on June 5, 2018, in Room 2226 of the Rayburn House Office Building. 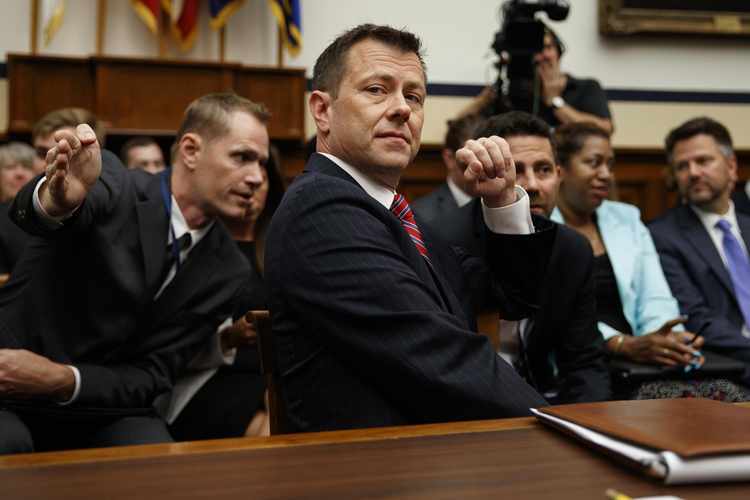 The questioning, by congressmen and House committee staff, focused on whether the FBI had applied the same rigor to the Clinton investigation that it had to the Trump probe. The transcript the public can read today contains not only those questions and Priestap’s responses, but also the tell-tale redactions of anxious bureaucrats. One thing that is very clear is that the Sharpie brigades at the Federal Bureau of Investigation and Department of Justice really, really didn’t want anyone to know where Bill Priestap was a week into May 2016. 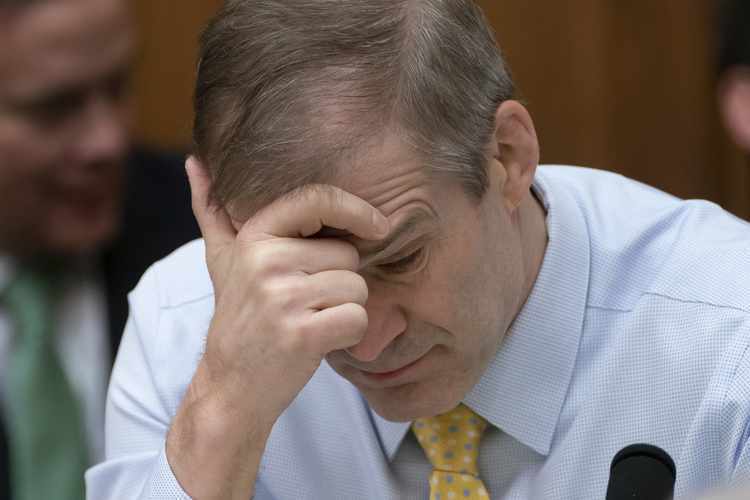 Rep. Jim Jordan: Where in the world was Bill Priestap? The seeming comedy routine notwithstanding, Jordan later asked how many times in his 2½ years running the counter-intelligence shop Priestap had traveled abroad. “I want to say three times,” he said. “And can you tell me where you went?” Jordan asked. Jordan drilled in: “All three times to [REDACTED]? Jordan was back at it in later rounds of questioning, asking whether Priestap had traveled to a given location at a given time in 2016. Over and again, censors from the FBI and DoJ have redacted the location and the time. What could this exotic destination be? How is the timing of Priestap’s trip there a matter of national security? What secrets were the redactors trying to protect? Peter Strzok: “Bill” was in London. So there we have it. Bill Priestap was in London on or around May 9. Which strongly suggests that all three of the international trips taken by him during his tenure as FBI counterintelligence chief were to London. “So,” Priestap replied, “I went to meet with a foreign partner, foreign government partner.” In other words, almost certainly British intelligence. Not exposing our British partners has been the Justice Department’s justification for locking up secrets about the beginnings of the Trump investigation. The redactions try and fail to hide that Priestap met repeatedly with his British counterparts in 2016. Trump campaign adviser George Papadopoulos was also in London. So was the FBI, around the same time. Students of the Russia-collusion saga will recall that some of the earliest and most significant events cited as leading to the FBI’s investigation of Team Trump took place in a certain REDACTED country during a REDACTED season in 2016. 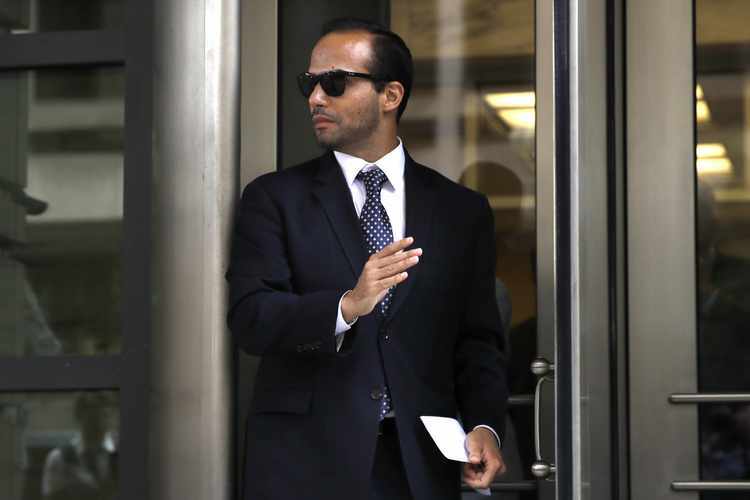 It was over breakfast on April 26 in London that the mysterious Maltese professor, Joseph Mifsud, told young Trump campaign adviser George Papadopoulos that the Russians had “dirt” on Hillary Clinton. Five days later, on May 1, Papadopoulos had drinks with Australian diplomat Alexander Downer in a London bar where he shared this piece of gossip/intel. And, of course, London is home to the author of the anti-Trump “dossier,” Christopher Steele. According to the official story laid out in the New York Times, Australian officials did not pass on this new information for two months. And while Steele was retained by the opposition research firm Fusion GPS in the spring to dig up dirt on Trump for the Clinton campaign, the official story is that he did not start working with U.S. officials until the summer. After some dodging and weaving, Jordan came back to the question, but this time with an uncomfortable specificity: “Was your second trip then concerning the Trump-Russia investigation?” he asked. Priestap could have answered “no” without perjuring himself, he could have quickly put this matter to bed. His “I’m not at liberty” answers strongly suggest that the Trump-Russia investigation was exactly what his second trip to London was about. Attorney General Barr’s statement that “spying did occur” on the Trump campaign makes another part of Priestap’s testimony – about why an FBI asset in London named Stefan Halper reached out to Papadopoulos and to another Trump foreign policy adviser, Carter Page — even more significant. 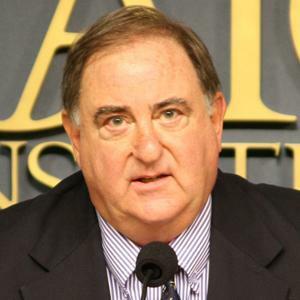 Stefan Halper: also in London. Weeks before Priestap’s testimony was taken last summer, the efforts of Halper, an American scholar who works in Britain, had been exposed. Republicans had been spluttering with outrage that the FBI would deploy a spy against an American presidential campaign. Democrats had been countering that while the bureau used informants, only the ignorant and uninitiated would call them spies. Democratic staff counsel Valerie Shen tried to use her questioning of Priestap to put the spying issue to bed. “Does the FBI use spies?” she asked the assistant director for counterintelligence (who would be in a position to know). Before Priestap answered, his lawyer, Mitch Ettinger, intervened. “Just one second,” he said. Then Ettinger – who was one of President Bill Clinton’s attorneys during the Paula Jones/Monica Lewinsky scandal – conferred with his client. So there we have it with all the decisive logic of a Socratic dialogue: The FBI could not possibly have spied on the Trump campaign because bureau lingo includes neither the noun “spy” nor the verb “to spy.” Whatever informants may have been employed, whatever tools of surveillance may have been utilized, the FBI did not spy on the Trump campaign – didn’t spy by definition, as the bureau doesn’t use the term (except, of course, to describe the very same activities when undertaken by foreigners). What’s telling about this line of questioning is that it inadvertently confirms Republican suspicions — and Attorney General Barr’s assertion. If House Democrats believed there had been no spying on the Trump campaign, they could have asked Priestap whether the FBI ever spies on Americans, given the common meaning of the verb “to spy.” They could have flat-out asked whether the FBI had spied on Trump World. Instead, Democratic counsel asked whether, given the FBI’s definition of spying, the bureau would “internally ever describe themselves as spying on American citizens.” It would seem that Democrats were every bit as convinced as Republicans that the FBI spied on Trump’s people. “Not in my opinion,” responded Priestap. What Shen was laboring to establish was that the only sort of investigative behavior that could be called political interference was when someone at DoJ or FBI acted out of “purely political considerations.” That’s a standard that leaves plenty of room for politics. But does it leave room enough for the “dossier”? The political abuse foremost in Republican minds was, and remains, that collection of howlers and hearsay allegedly compiled by Christopher Steele, who was sold to the public as a high-minded former British spy instead of a man being paid by the Clinton campaign to dirty up Trump. Steele’s efforts were lapped up by the FBI and DoJ even though the lawmen knew Steele was peddling political work-product — opposition research paid for by Hillary Clinton’s campaign and the Democratic National Committee. 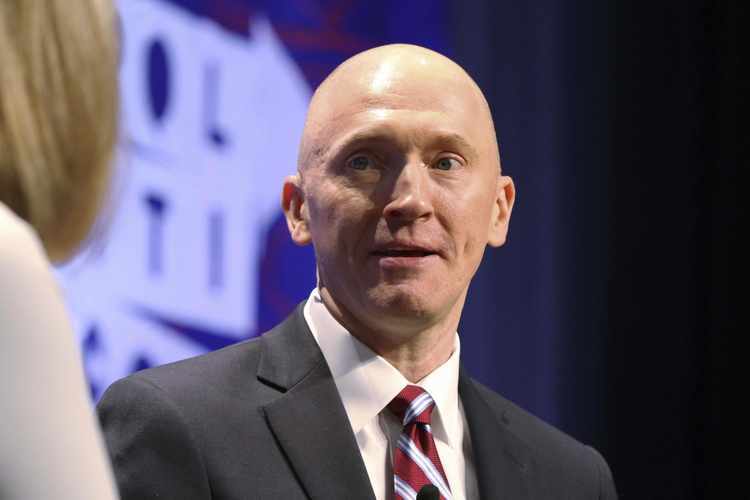 Carter Page: Was he the real quarry, or was Donald Trump? Priestap gave the most unambiguous and definitive of answers: “No.” One might be tempted to think that was an endorsement of the dossier, a confirmation that the FISA warrant applications were largely based on information that was neither politically biased nor unverified. But that would be taking the question and the answer on face value, when something rather less straightforward was going on. Sit back and savor that exchange for a moment. One of the most senior officials in the Federal Bureau of Investigation – an organization that regularly refers for prosecution people who don’t tell the full truth – champions this peculiar standard of credibility: If you can snooker a FISA court judge, the information used to traduce the court is rendered by definition “credible sufficient information.” What is the condition of the FBI if its leaders think whatever you can get past a judge is good enough? That long road to “no” strong suggests that the highest levels of Justice and the FBI personally targeted Trump and took action against him. The only caveat is that Priestap believes none of that targeted action was done to undercut Trump politically. That may be so (however much the savvy observer may think otherwise). But it doesn’t blunt the main takeaway — that the bureau and DoJ targeted Trump. So what did we learn from Bill Priestap’s compendious and revealing testimony? We learned that the FBI and Justice targeted and took action against Trump. We learned that the FBI, according to Priestap, is incapable of securing a FISA warrant with information that isn’t credible, although the judge’s approval of the warrant means by definition that the information is credible. We learned that the FBI believes political interference in an investigation can be proper as long as the bureau isn’t acting purely politically. We learned that the FBI did send at least one asset to do to the Trump campaign an activity that even the bureau would call “spying” — if it were done by foreign operatives. We learned that the origins of the Trump-Russia tale will never be fully understood until the part played by British intelligence is made clear. That’s an awful lot to take away from one largely neglected transcript. But it suggests just how much remains unknown about the Trump-Russia investigation while providing a glimpse at the people that want to keep it that way. Democratic presidential candidate, Julián Castro, said all those running for president should be required to release their tax returns. Castro, the former Housing and Urban Development secretary made his comments on Thursday during a CNN town hall. A video excerpt was posted on the CNN Twitter account. “I support making it a requirement by statute — Congress passing a law that requires people who are running for president to submit 10 years of their tax returns,” he said. Castro, who said he would release 10 years of his tax returns in the next few weeks, blasted President Donald Trump’s refusal to release his own. His comments come as Democrats continued to pressure Trump to provide his tax returns. President Donald Trump is downplaying the chances of reaching a bipartisan two-year agreement to escape billions of dollars in spending reductions. Politico noted House Democrats failed this week to gain support to pass a bill that would ward off $126 billion in spending cuts in the fiscal that starts on October 1 and cuts for the following fiscal year. The Trump administration maintains it would lead to nearly $2 trillion in spending increases over 10 years, according to Politico. Meanwhile, White House economic adviser Larry Kudlow warned that Trump might initiate a budget sequester and allow about $125 billion in cuts for both defense and non-defense spending if Congress does not agree to his 2020 budget. 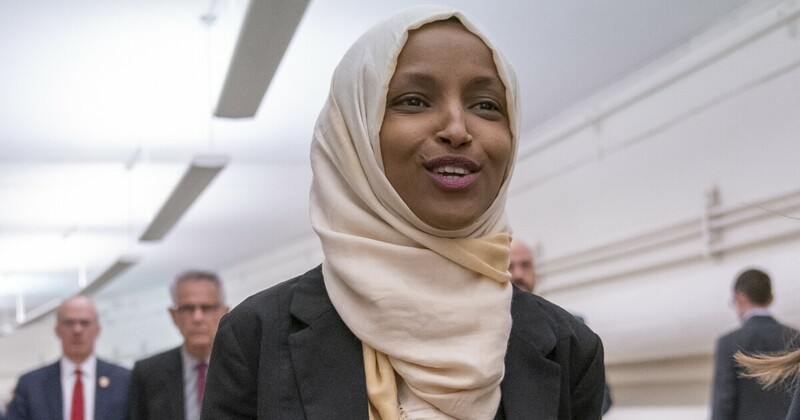 Considering her qualified apologies following repeated statements in evidence of such a viewpoint, Rep. Ilhan Omar, D-Minn., is likely anti-Semitic. Many observers are now criticizing Omar. They say her words diminish the 2,977 victims who died on 9/11, and the significance of that day in American history. But I suspect Omar’s intent was not malicious or derisory. Rather, I believe Omar was attempting to draw divergence between her Islamic faith and the al Qaeda fanatics who carried out the 9/11 attacks. When she says that “some people” did it, she meant “some people who are not us” or “not like us,” referring to herself and peaceful, mainstream adherents of Islam in the U.S. Yes, Omar’s words were poorly chosen. And as my colleague Tiana Lowe aptly observes, Rep. Alexandria Ocasio-Cortez, D-N.Y., is utterly wrong to support Omar by challenging the patriotism of Rep. Dan Crenshaw, R-Texas. Crenshaw is a combat veteran of the fight against al Qaeda in Iraq. He has done a lot more to serve this nation than AOC, Omar, and just about every other member of Congress for that matter. But I do not believe Omar’s words were designed to deride our fallen fellow citizens. The freshman congresswoman was drawing a positive application of “otherness” with regards to the ideological separation between American Muslims and al Qaeda. While it is true that al Qaeda are Islamic fanatics, it is also understandable why Omar would be frustrated at the damage that the 9/11 attacks did to American perceptions of her faith. Many Muslims also died on 9/11, and that the vast majority of American Muslims are decent patriots. Maybe I’m wrong, but I think that was her key point: al Qaeda are not us, and their evil should not be used to collectively punish Muslims. You don’t have to approve of CAIR or Omar to appreciate the legitimacy of this idea. Senate Majority Leader Mitch McConnell is declining to say whether he thinks his chamber would confirm Herman Cain to join the Federal Reserve board, casting doubt on the former Republican presidential candidate’s prospects should President Donald Trump advance him for the post. Asked Thursday if a Cain nomination would face problems , McConnell, R-Ky., noted that successful nominees must pass background checks and have a likelihood of confirmation. Trump’s interest in potentially nominating Cain along with another political ally, conservative commentator Stephen Moore , has sparked questions among lawmakers from both parties in Congress about the president’s influence on the central bank. Fed Chairman Jerome Powell reiterated the importance of the Fed’s independence during a talk Thursday evening with House Democrats meeting in Virginia for their annual issues retreat, according to a source in the room unauthorized to discuss the private session. Powell told lawmakers that he saw his role as totally apolitical. He also said the Fed does not consider political pressure in its decision making, the source said. Another source in the room confirmed the remarks. The chairman fielded questions from lawmakers during a question-and-answer session in Lansdowne, but declined to comment on the president’s potential picks. Powell was Trump’s choice to lead the Fed, but the president has been critical of him for raising interest rates. Earlier Thursday, House Speaker Nancy Pelosi said elevating Cain and Moore to the Fed would risk politicizing the nation’s central bank and endangering the economy. “These two appointments to the Fed are the worst, ill-suited appointment that the president could come up with,” she told reporters. Three GOP senators — Utah’s Mitt Romney, Alaska’s Lisa Murkowski and North Dakota’s Kevin Cramer — told The Associated Press they’d likely vote against Cain. With Republicans controlling the Senate 53-47, it would take opposition from just four GOP senators to sink the nomination, assuming all Democrats are also “no” votes. As he did earlier this week, McConnell also sidestepped a question about whether he would back Cain or Moore, a Fed critic and former Trump campaign aide, for the board. Trump has said he will nominate both men. “We’ll see who’s actually nominated,” said McConnell. Cain has run into concerns by lawmakers from both parties that, as a Trump loyalist and deeply conservative political figure, he would threaten the Fed’s traditional political independence. Trump himself has taken a nontraditional approach to the Fed, repeatedly accusing it of mismanaging the economy by not pushing hard enough for low interest rates. The White House offered no fresh comment Thursday about Trump’s intentions, referring reporters to his earlier comments about Cain. Trump initially called Cain “a very terrific man” who would “do very well there.” But he said earlier this week that he didn’t know how Cain was faring in the vetting process and that Cain “will make that determination” whether to continue. Cain formerly served on the board of the Fed’s Kansas City regional bank. He has also called for a return to the gold standard to control inflation, which most economists consider unworkable. Moore is a conservative commentator and another Trump political ally.